-Character Advantages/Talents: As an average security model Protectron, Caster has no inherent talents. Instead, whatever knowledge he possess is afforded to him by any programmer who manages to hook him into a terminal and adjust his programming settings to an almost infinite number of combinations at the programmers leisure. Despite this, some basic functions are hardwired into Caster, the same as any protectron. These functions include simple threat assessment, I.E. self defense, how to walk, terrain navigation, and the identification of certain United States officials such as soldiers or police officers. Caster's heavy protectron frame allows him to take a heavy amount of small arms fire and continue moving, and as well the relatively simple robotics of the protectron series make it simple to repair when compared to more advanced machines such as Mr. Handy's. As well, both his hands are equipped with low-power laser pistol emitters as to form a self defense. These weapons are powered by the fusion cell which also keeps Caster running, and as such never need to reload so long as he is charged. -Character Disadvantages/Weaknesses: Like any protectron, Caster cannot move at more than a brisk walking speed, and cannot traverse rough terrain. As well, he is incapable of making complicated decisions on his own, and requires guidance to actually do anything particularly worth while. -Current Equipment: Caster has no equipment that isn't built into his body. The only two weapons he has are the laser pistols built into his hands. -Backstory: Caster was built as a standard security model protectron at the ROBCO Industrial Manufacturing Plant located near Saint Louis in the year 2065. 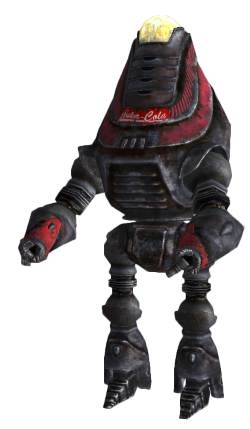 A year after he was completed, he was sold to the Nuka-Cola company to provide security for a Nuka-Cola Plant in Chicago as part of a bulk buy to provide a cheap security force for the plant. With a new set of paint, Caster spent the next 8 years doing absolutely nothing, as protectrons often do. After this time the life of the protectron was advanced only slightly in a change of rolls, as due to the breakdown of equipment security units had been assigned to the assembly line. Caster in particular was placed in the roll of 'cap assignment', in which he placed the metalic caps on Nuka-Cola bottles. Another three years saw an even more drastic change than this, in the form of nuclear war. As the world was plunged into the Atomic abyss, Caster's only response was an acknowledgement of a large light disturbance which he relayed to his foreman. The protectron continued to operate for the next two years in the bombed out plant, still placing the caps on empty bottles on the still operating production line. Eventually, the charge of Caster's fusion cell ran out, and after that, came nothing but darkness. Eventually the darkness was replaced with light as an unknown amount of time later, a wasteland scavenger had dragged Caster out of the factory and into a working charging station. This man, known to Caster only as the name he had been programmed to know him by, 'Wizard', would become Caster's first and most prominent companion, and even gave him the name he still identifies with today. Together with Wizard Caster traveled much of of the west and mid west, traveling to such locations as New Vegas, Junktown, San Francisco, and Shady Sands. It was in California where Wizard was dragged away by slavers never to be seen again and Caster was left as scraps in the desert. From here Caster was yet again reawakened by another scavenger in what would become an endless cycle of activation, travel, and deactivation. By 2240 Caster has traded hands more times than his aged databanks can accurately recall, and has served in even more roles during that time, from everything between bartender to construction worker to caravan guard to salesbot. Eventually Caster was dragged across the wasteland to a new area, the eastern states, and specifically to Maryland. With his most recent master having fallen to Mirelurks in the swamp, Caster now wanders aimlessly, almost awaiting his inevitable shutdown, and inevitable activation.